"And you say, "Oh my God Am I here all alone?"" The Central Park Concert (2003), Busted Stuff (2002), The Best Of What's Around, Vol. 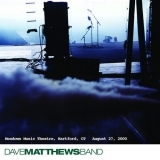 1 (compilation) (2006), Live At Piedmont Park (2007), Live Trax Vol. 3: Hartford, CT August 27, 2000 (this album) (2005), Live Trax Vol. 6: Boston, MA July 7-8, 2006 (2006), Live Trax Vol. 9: Las Vegas, NV March 23-24, 2007 (2007), Live Trax Vol. 8: East Troy, WI August 7, 2004 (2007), Live Trax Vol. 10: Lisbon, Portugal May 25, 2007 (2007), Live Trax Vol. 13: St. Louis, MO June 7, 2008 (2008).